In late November 2018, judgment was handed down on a claimant’s successful appeal of a court ruling, which struck out an industrial disease claim. The defendants in this action were initially successful, at Middlesbrough County Court, after contending that the court had the discretion to strike out a statement of case, given the claimant’s failure to attach medical evidence and a schedule of loss to the Particulars of Claim. This case regarded an occupational silicosis and massive pulmonary fibrosis claim. The claim was brought by a 61-year-old claimant, who alleged that his personal injury was suffered as a result of silica dust inhalation in the course of work with 3 defendant employers. The claimant had formerly been employed as a shot blaster and shot-blast supervisor. The alleged source of respirable silica dust was through use of blast kettles. These are containers into which abrasive silicate is poured. A compressor blasts the contents of the kettle using compressed air and a hose, spraying silica dust into the surrounding air, which the claimant breathed in. The procedural context of this claim, which led to the defendant’s strike out applications, is complex. For chronology, the original Letter of Claim was sent to the 1st defendant (D1) on 22 February 2013, but this was not seen, due to a communication issue. On 27 May 2015, however, D1 was alerted to the existence of the claim, when the Claim Notification Form was received. One month later (24 June 2015), the Claim Form was received by the Court, citing D1 as the only defendant to proceedings. Although the court did not issue the Claim form until 1 July 2015, the date of issue was critically deemed to be 24 June. This was just 3 days before the 3-year limitation period for personal injuries was due to expire. ‘The medical evidence to support Pneumoconiosis is highly specialised. The number of private medico-legal experts in the Claimant's area is restricted and as a result obtaining any medical report can take several weeks. Without the Claimant's medical evidence we will be unable to serve the papers upon the Defendant and fully assess the prospects of success. The Claimant's solicitors have now instructed a medical agency to arrange an appointment on behalf of the Claimant and we are currently awaiting an appointment date. The Claimant's solicitors will require to review the medical report, and if necessary, instruct Counsel to advise and to draft the Particulars of Claim and any supporting schedule of loss’. On this occasion, Deputy District Judge Greenan granted an extension for service of the Claim Form on D1 by 1 March 2016. HOWEVER, the claimant’s application had been granted in breach of CPR 23.9, as neither the application notice, nor the supporting evidence, nor the Order had been served on D1. It was not until 9 October 2015 that D1 was provided with a copy of the Order granting the extension. In a change of events, D1 received a Notice of Change from newly instructed solicitors, on 22 October 2015. The 2nd defendant (D2) subsequently received a full Letter of Claim, on 14 January 2016. Then, on 25 January 2016, the claimant made his second Without Notice application to further extend time for service of the Claim Form, Particulars of Claim, medical report and other supporting documentation. Deputy District Judge Pickup refused to grant the claimant’s application. Regardless, on 24 February 2016, the Claim Form was amended without consent, pursuant to CPR 17.1(1), adding D2 and the 3rd defendant (D3) as named defendants to the claim. 2 days later, on 26 February 2016, the Claim Form was served on all 3 defendants, along with the Particulars of Claim. HOWEVER, medical evidence and the schedule of loss were omitted from the documents served without any explanation as to why. All of the defendants provided Acknowledgements of Service. D1 and D2 stated their intention to defend the claim, while D3 contested jurisdiction. D2’s defence, served in May 2016, raised 5 grounds of defence, the 3rd of which was the same single ground of defence pleaded by D1 – namely that the proceedings should be struck out for non-compliance with PD 16.4. Within 10 days of the claimant receiving the expert report from Dr Bone, the medical evidence was sent to all 3 defendants with the schedule of loss, on 19 May 2016. Thus, the delay between the claimant’s service of the Particulars and the defendants’ receipt of the medical report was 7 days short of 3 months (26 February 2016 to 19 May 2016). On 9 June 2016 and 1 July 2016, respectively, D1 and D2 filed applications seeking that the claim be struck out, or alternatively that summary judgment be entered, on account of the claimant’s lack of compliance with the relevant Practice Direction. Subsequently, on 29 September 2016, D1 and D2 filed a jointly served ‘Position paper’, sounding their grounds for strike out/summary judgment. The 1st instance application hearing was listed to be heard before His Honour Judge Gargan, on 10 November 2016. The 1st instance judgment was handed down by HHJ Gargan on 8 May 2017, striking out the claimant’s claim against all 3 defendants. Before considering the applications of D1 and D2, HHJ Gargan struck out the claim against D3. Having contested jurisdiction in its Acknowledgement of Service, D3 challenged DDJ Greenan’s original Order granting the claimant an extension of time for service of the Claim Form, arguing that it should be set aside. ‘The reasons ... may well be strong reasons for delaying service of the Particulars of Claim but to my mind they come nowhere near sufficient reasons for extending the time for service of the claim form. There is just no reason why the claim form could not be served on an application to extend the time for serving the Particulars of Claim’. ‘... when it became apparent that it would not be possible to obtain a medical report before the time for service of the Claim Form expired, the Claim Form should have been served and an extension of time sought for the service of Particulars of Claim’. As such, it was unnecessary for the judge at 1st instance to rely on D3’s additional grounds for strike out, including the claimant’s failure to serve the expert medical report with the Particulars. Was the failure to serve a schedule of loss and medical report with the Particulars of Claim within the scope of an application for relief from sanctions? Was there an abuse of process? ‘In my judgment a claimant who cannot prove his claim without medical evidence is 'relying on the evidence of a medical practitioner' for the purposes of CPR 16 PD 4.3 whether or not a medical report has yet been obtained. Therefore, such a claimant is under an obligation to serve the evidence of a medical practitioner with the Particulars of Claim. 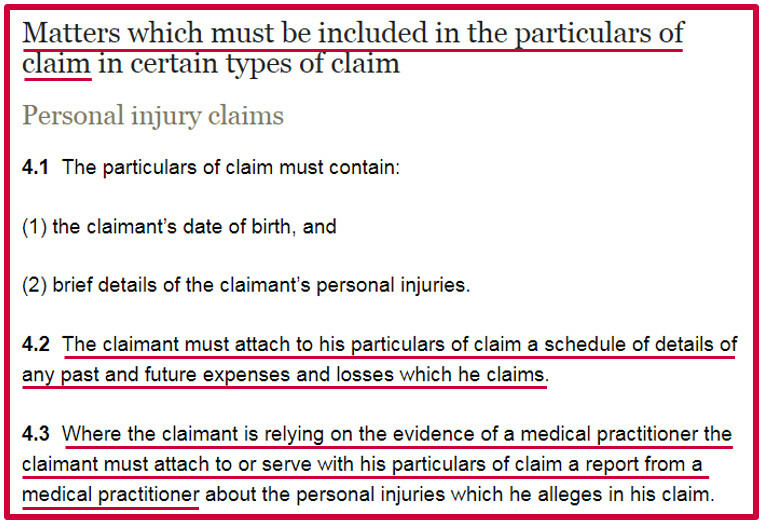 To hold otherwise would mean that a claimant in a personal injury action who delayed in obtaining medical evidence would never be required to seek permission to extend the time for service of the medical evidence and/or seek permission from the court to serve the Particulars of Claim without such evidence. There was widespread acceptance among personal injury practitioners that such applications are required ... It is quite clear that medical evidence will be required to establish causation and quantum in this case. Therefore, in my judgment, the claimant was obliged to serve a medical report with the Particulars of Claim unless the court granted an extension of time for such service’. He concluded that the claimant could not ‘simply ignore the provisions of the practice direction’ and therefore, in absence of an express sanction, implied a sanction for non-compliance with PD 16.4. Thus, it was necessary to consider relief. Was the breach ‘serious’ and ‘significant’? Was there ‘good reason’ for the breach? In light of ‘all the circumstances’ of the case, should relief be granted? HHJ Gargan judged that the claimant’s breach ‘should be regarded as serious and significant although ... very much at the lower end of the scale of such breaches’. What is more, he found no ‘good reason’ for the breach, given significant delay without explanation. ‘... when the claimant's default is placed in context, it shows what amounts to a flagrant disregard for the rules and practice directions governing the conduct of litigation. The claimant's overall conduct has, in my judgment, significantly prejudiced the defendants and has undoubtedly affected the smooth running of the litigation as a whole. Therefore in all the circumstances of the case I do not consider that relief from sanctions should be granted even though the effect of that is to deprive the claimant of a substantial personal injury claim. It follows that the claimant cannot rely upon the medical report and/or the schedule. Therefore, it necessarily follows that his claim must fail and be struck out’. ‘In my judgment the claimant's conduct (or that of his solicitors with which he is fixed) represents a flagrant disregard for the rules. In my judgment the failures have (cumulatively) had a significant adverse impact upon the way in which the defendants have been able to deal with the claim. Therefore, even were this not an implied relief against sanctions claim I would strike out the Claim’. The High Court Appeal was heard by Mr Justice Spencer on 5 November 2018. The claimant appealed only in respect of D1 and D2. By way of interpretation, the claimant’s argument, on appeal, was that a lack of express wording in PD 16.4 insinuated that their breach should not be met with sanction. Further, that an implied sanction was equally inapplicable. As a result, counsel for the claimant submitted that HHJ Gargan had misapplied the law at 1st instance, when he found that the claimant’s failure to serve their medical evidence with the Particulars of Claim engaged the principles of Mitchell and Denton, pressurising the claimant into making an application under CPR 3.9 for relief from sanctions. According to the claimant, therefore, the correct approach for non-compliance with PD 16.4 was not for the claimant to apply for relief, but for the defendant to make an application seeking an order for service of the medical report. ‘It must be stressed ... that the ultimate question for the court in deciding whether to impose the sanction of strike-out is materially different from that in deciding whether to grant relief from a sanction which has already been imposed’. The claimant further submitted that HHJ Gargan had introduced an implied sanction, i.e. that medical evidence not served with the Particulars of Claim is automatically rendered inadmissible. It was posed that such an assumption bypassed any consideration of proportionality and could not ‘be said to arise by logical implication’. In addition, it was contended that the 1st instance judge had ‘incorrectly equated permission to rely on the medical evidence and schedule of loss’ with the required steps under CPR 16.4. By contrast, counsel for the defendant argued in favour of strict interpretation of PD 16.4 wording. It was argued that the word ‘must’ demonstrated that compliance with the Practice Direction was mandatory and failure to adhere was equivalent to failure to comply with a Rule or an Order of the court. It was unlikely that PD 16.4 would allow medical evidence to be exchanged ‘at some indefinite time in the future’. Thus, it was clearly a ‘temporal requirement’. ‘... a number of cases dating back more than a decade [in which] the courts have recognised the existence of implied sanctions capable of engaging the approach contained in rule 3.9 and the Mitchell/Denton principles’. ‘... the correct approach is to look at the importance of the rule, the reason for the rule, the way in which it is expressed (whether mandatory or not) and whether breach of the rule can be described as "a mere error of procedure”’. The defendant averred, by application of this test, that breach of PD 16.4 ‘is properly designated as a failure which carries the Mitchell/Denton regime’. Do Parties in Breach of PD 16.4 Require Relief from Sanctions? In answer to this question, Spencer J contemplated that an implied need to apply for relief should stem from the ‘default position’ if an application for relief is refused. ‘Often, within the context of the particular litigation, this will be a trivial breach because compliance can be achieved with the service of documents which, in the end, are relatively uninformative and do not take the matter any further’. Spencer J therefore disagreed with the judge at 1st instance and found in favour of the claimant, whose breach did not engage the relief from sanctions doctrine. In additional comments, Spencer J preferred the claimant’s interpretation that ‘a characteristic of the drafting of the CPR’ is that ‘the world “must” is used liberally’. 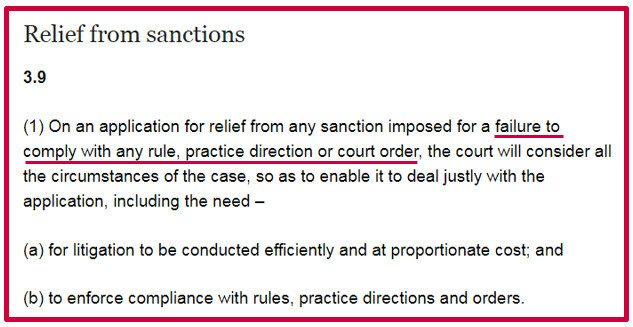 If, instead, the intention behind procedural Rules and Directions was to demand that defaulting parties apply for relief from sanctions whenever the word ‘must’ is used, the courts would be ‘inundated with applications quite unnecessarily’. Did the Claimant’s Breach of PD 16.4 Constitute an Abuse of Process? Accordingly, the appeal was allowed and the case was reinstated in respect of D1 and D2.